READING, PA – Because of the stormy weather, the Berks Arts Council moved Friday night’s Bandshell Concert to the DoubleTree by Hilton. 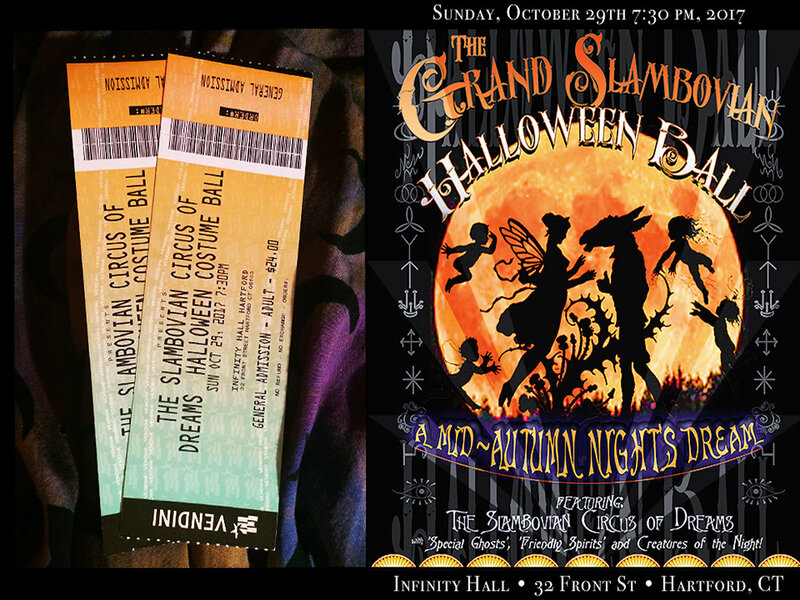 Those who ventured forth to hear the Slambovian Circus of Dreams were amply rewarded with a concert that had the fresh, innovative, at times whimsical and deeply hopeful spirit of the late 1960s. This band, while certainly not a household name, has attracted a loyal following and has preserved a genuine, down-home quality that is irresistible.They sound somehow familiar, and yet unique. They combine psychedelic guitar riffs with folkish accordion and mandolin; their songs are deceptively simple with plenty of room for singalong a la the late Pete Seeger; and like the Beatles, they borrow from music hall, vaudeville and the circus. Their core consists of guitarist/singer/songwriter Joziah Longo; his wife Tink, a multi-instrumentalist who played accordion, cello, flute, and even cittern during the concert; and guitarist/mandolinist/vocalist Sharkey McEwen. Joining them were Kolson Pickard on trumpet and guitar and drummer Rick Quintanal; Pickard and McEwen took turns playing bass. All are top-notch musicians.Longo, in his trademark top hat and round glasses, displayed a remarkable ability to engage with the audience from their opening signature song, “The Grand Slambovians,” with its heavy, thumping beat, to the end. He knew instinctively who his audience was, and had them singing most of the words to the Beatles’ “I Get By With a Little Help From My Friends” and buzzing along with his “I Know Where the Bees Have Gone.” Meanwhile, a small girl near the front jumped and twirled, pigtails flying.Longo’s own “Very Unusual Head” was a waltz with a strong beat and a circusy tune, lovely and a little twisted, like a house of mirrors.”Baby Jane,” a beautiful, bittersweet ballad, gave warning advice, remaining a bit enigmatic; “Step Out of Time,” which Longo described as a Seeger/Allman Brothers/Jethro Tull mashup, captured the feelings many have about the present era.The clever “Solve It All Daily” (a word play on the artist Salvador Dali) began with an impressive Spanish-style trumpet solo by Pickard and flamenco-style guitar by McEwen, and then became part-Celtic, part-Jacques Brel with tin whistle and hand-clapping.The second half started with a nod to Longo’s South Philly roots, as they played a Mummerish version of “Has Anybody Seen My Gal.” They played “Look Around,” a wonderful Beatles-influenced song, and then a new song whose opening line, “Somebody told me they’re making up lies,” resonated, as did “search for a now that’s worth forever, peaceful and strong. “The muscular and psychedelic “Tink,” was about his talented, steadfast wife and about the uprising of women, which Longo anticipates for the betterment of the planet.They ended with “The Trans-Slambovian Bi-Polar Express” after a brief rendition of the Beatles’ “Within You Without You” to serve as its introduction. Here’s hoping they return to this area many times. Summertime, and the livin’ is… positively Slambovian, of course. And with a simmering, shimmering season fast approaching, what could be a better kick to the playlist than a hometown gig in Beacon, NY at The Towne Crier? (more shows, see below). They always come home, our road tested Slambovians and, on Sunday, May 28 they’ll take the Towne Crier stage with the soundtrack to Summer of 2017: New songs and new sounds that promise to stand toe-to-toe with any Slambovian chestnut of your choosing. Be it the affirming “Absolutely Beautiful Freakin’ Day” to the hopefully trippy sing-a-long “I Know Where the Bees Have Gone”, Joziah’s got tricks up his sleeve and many stories to tell . . . While fighting back a tone-deaf industry, it’s safe to say the Slambovians pioneered Americana, bringing psychedelia to the mix and making it their own. Then in turn making it ours. But you know that already. So come and join the celebration. No stranger to Slambovia*, Kolson will be helping engineer and play on the new album over the next few months while Sharkey takes time to recover from his South American adventure... *Kolson recorded on the 'Flapjacks' track "Call To The Mystic". Sellersville Theater welcomes back New York’s Slambovian Circus of Dreams Friday, April 7th for a show featuring all the “hits” from their catalog as well as a “sneak peak” of the new songs from their next release “A Very Unusual Head” due out later this year.